EE has suspended its Power Bar swap scheme to investigate whether a hardware failure may be causing the devices to overheat. The operator said in a statement that it had suspended the swap scheme while it investigates the possible fire hazard risk. It has received five reports of chargers overheating, and earlier this year a medical student reported serious burns from a Power Bar exploding. EE is asking customers with bars featuring serial number 'E1-06' on the side to return the products immediately. It will give customers a £20 voucher for accessories as compensation. EE also will not be swapping any depleted Power Bar for the time being, regardless of the serial number. The operator didn't say how long its investigation would take, or when the swap scheme would be back up and running. The operator told Marketing that the problem affects one batch in seven. Since there are 1.5 million chargers available, that could mean around 200,000 chargers are affected by the problem. EE said in a statement: "We have identified a very small number of incidents where Power Bars have overheated, all of which relate to batch E1-06 (written as Model:E1-06 on side), and could pose a fire safety risk. An EE spokesman told Marketing that the problem was down to a "thermal runaway", where the charger's battery failed to prevent overheating. He added that recalling the faulty chargers was a "voluntary decision" by EE to ensure customer safety. 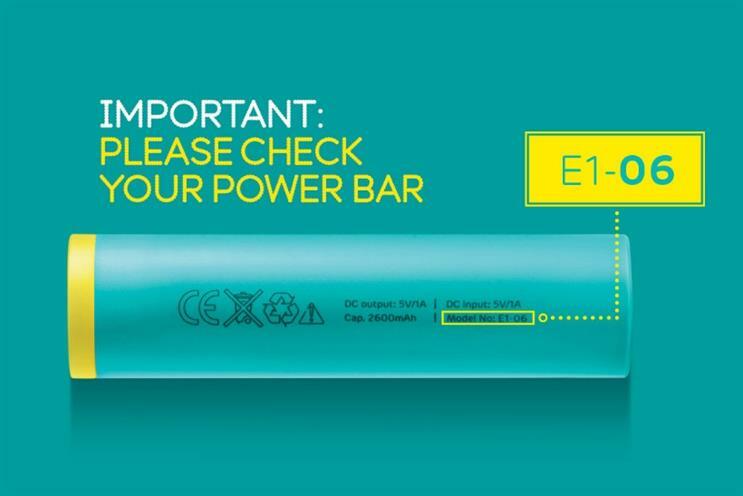 EE launched the Power Bar scheme to much fanfare in April, giving its customers free, portable battery chargers. Customers on certain tariffs could claim the bars at any store for free, then swap them once they had recharged their phones. It also brought the scheme to EE customers in Glastonbury. Last month, one Power Bar owner said she had suffered serious burns after plugging the device into her laptop. It exploded and flew under her bed, where it caught fire. The victim then sustained burns while trying to put the flame out. At the time, EE claimed this was an "isolated incident".